Conscious Content Dance is choreographed dance instruction to music with meaning. Classes are taught in the styles of hip-hop and lyrical. In class your inner Cheerleader will meet you as a Hip Hopper who speaks Positive Affirmations while moving with Excited Energy! You ready? 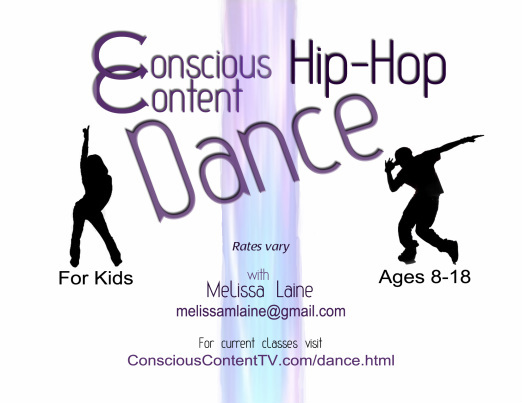 If you want your child to be positively influenced by the music they listen and dance to, then allow them to attend "Conscious Hip-Hop Dance Class". They will dance to music artists who’s self expression revolves around themes of inner change, self-growth, and unity. In this class students will learn choreography to one dance per month and perform it for their parents at the end of the last class. All music is upbeat, positive and enthusiastic while still having the hip-hop beats and flavor. Melissa Laine received her dance training from local Chico studios and dance teams while in High School and College. She performed with Full Force Hip-Hop Dance Company, Chico High Dance Team, Chico High Winterguard, Chico High Cheer, and Butte College Dance Team. Melissa enjoys sharing her dance skills by teaching children. She has experience in teaching Kindergarden Cheerleading as well as leading “Dance With the Team Day” workshops for children and teens. Melissa is excited to incorporate positive energy with her favorite style of dance, to create the Conscious Hip-Hop Dance Class. She hopes this class will inspire her students and raise their self-esteem. Melissa's Story: Hip-Hop dance class was a great time and space for me to let out and express my emotions through dance. I was extremely shy growing up. Once I started dance classes I began to gain confidence. If I had a problem or frustration I could just dance it out at class. Even though teachers would say leave your “stuff” at the door, I couldn’t help but bring it with me. I would use the beats, stomps, the pop and locks to move out the emotions through the energy in my body and transform whatever upset emotion I was having into a sense of accomplishment. Those feelings turned into confidence. I felt proud of myself for learning and performing intricate choreography. After dancing on many teams, I stopped taking classes because I did not like the messages in the mainstream hip-hop music that the teachers were playing. I matured into a very positive person and the music did not mature with me. Recently I have been meeting and finding many Conscious Music Artists whose songs are a perfect mix of positive messages with danceable beats. As with anything I create, I use conscious transformation to see what is missing and then create it. This is what I have done with Conscious Content TV and now Conscious Content DANCE.